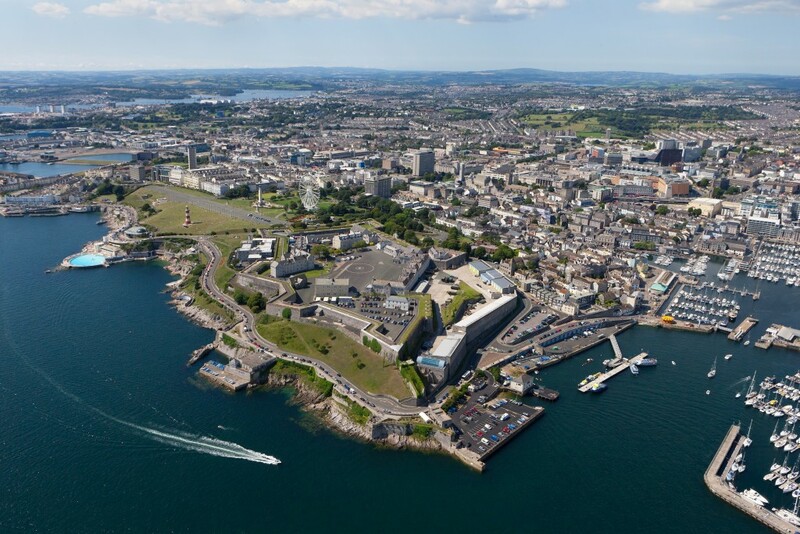 Plymouth, Britain’s Ocean City, is one of Europe’s most vibrant waterfront cities home to a top five modern UK university. One of the UK’s largest unis, its home to 27,000 students and is described by Times Higher Education as one of the newly emerging ‘modern global elite’. The university sits in the very centre of the city, opposite the Drake Circus Shopping Centre. Whether you’re visiting Plymouth for a short break, longer holiday or overnight stay, the city has a wide range of accommodation to suit all your needs. Built during the Golden Age of steam and steeped in history, the The Duke of Cornwall was Plymouth’s first luxury hotel and still provides first class accommodation and service today. The property has 72 rooms and suites, each with a unique view and decor. Plymouth’s excellent Theatre Royal is just around the corner and Plymouth Pavilions is directly opposite. Guests can also enjoy delicious food in the two RAC Blue Ribbons and AA Rosette award winning Restaurant. Located in ‘War Horse’ country between the wilds of Dartmoor National Park and a short drive from Plymouth, the four-star Moorland Garden Hotel is a great base for exploring the South West. Nestling in nine acres of tranquil grounds the hotel offers fine dining at its award-winning Wildflower Restaurant and casual fireside meals and afternoon teas at The Dartmoor Bar. In addition to the walking, cycling and horse-riding available in Dartmoor National Park, nearby attractions include the 700-year old National Trust property Buckland Abbey and the Plymouth Gin Distillery (England’s oldest working gin distillery). A 10 – 15 minute walk from the city centre, and with easy access to shops and sights, Premier Inn Plymouth (Lockyers Quay) is a great place to drop anchor. Or try The New Continental Hotel, Plymouth’s largest independent hotel, located in the heart of the city, adjacent to Plymouth Pavilions and moments away from Plymouth’s Historic Waterfront. This Victorian property combines traditional features with modern facilities, with 99 en-suite bedrooms, an in-house brasserie, onsite Leisure Complex with a swimming pool, steam room, sauna, weights room and gym as well as on-site parking and free Wi-Fi. Plymouth’s location between the sea, lush farmland and rolling moors provides the city, and its award-winning restaurants, with a wonderful natural larder of fine fresh food. As well as supplying restaurants in the city, Plymouth lands fish for the nation at the quayside and is surrounded by some of the best food producers in the country. Plymouth is home to several top TV chefs; local boys Chris and James Tanner run the popular Barbican Kitchen restaurant, Hugh Fearnley-Whittingstall opened the River Cottage Canteen and Deli at Royal William Yard in 2011 and British cookery legend Gary Rhodes has opened Rhodes @ The Dome on the Plymouth Hoe. Plymouth is home to many attractions including the National Marine Aquarium, the UK’s biggest aquarium, Theatre Royal Plymouth and Plymouth Pavilions, Ski Slope and Snowboard Centre and Dartmoor Zoo where the Hollywood Blockbuster ‘We Bought a Zoo’ was made. The Barbican and Sutton Harbour is one of Plymouth’s most popular places to visit, with quaint cobbled streets, a picturesque harbour and independent shops, galleries, bars, cafes and restaurants along the water’s edge creating a metropolitan feel. It’s also home to the Elizabethan House and the Mayflower Steps where the Pilgrim Fathers set sail on their voyage to the New World in 1620. Plymouth Hoe is where Sir Francis Drake played his last game of bowls before his sailing voyage to engage with the Spanish Armada. Also home to the iconic Smeaton’s Tower, Tinside Lido, Royal Citadel and the city’s war memorials the Hoe is a large open-space with jaw-dropping views. Take a trip to the Royal William Yard, which was designed by Victorian architect Sir John Rennie and constructed between 1825 and 1831. It’s the largest collection of Grade 1 listed military buildings in Europe. Stroll around the Yard and stop off at one of the many eateries for a spot of lunch, afternoon tea or dinner. If you like to shop, the city centre features many independent retailers as well as national brands and high street names in its varied shopping areas. Regularly hosting outdoor markets visitors will often get to taste Devon’s fantastic local produce. Head to Plymouth City Market to find a great selection of clothes, food and gifts. Take your time wandering around the extensive range of independent and specialist retailers in the Independent Quarter, pick up unique pieces of art from the Barbican’s Historic Quarter or enjoy shopping in Plymouth’s landmark shopping centre, Drake Circus.